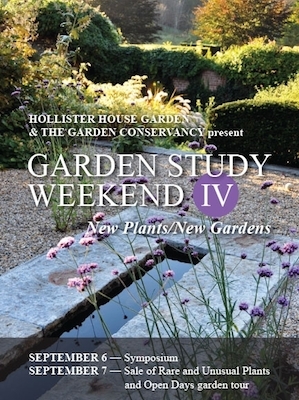 WASHINGTON, CT - July 9, 2014 - On September 6 and 7 the Garden Conservancy and Hollister House Garden will present their fourth biennial Garden Study Weekend. On Saturday, "New Plants/New Gardens," a symposium at the Heritage Hotel in Southbury, CT, will provide an opportunity to hear some of the most interesting voices in landscape architecture, ecological design, and horticulture at work today. On Sunday, there will be a Garden Conservancy Litchfield County Open Day, a self-guided garden tour of five outstanding gardens in picturesque Litchfield County, and a Rare and Unusual Plant Sale at Hollister House Garden in Washington, CT, featuring selections for the late-season garden from some of the Northeast's leading specialty nurseries. The Hollister House Garden Study Weekend launched in 2008. Held every two years, the multi-faceted weekend has quickly grown to one of the leading summer gardening events in New England, drawing avid garden lovers from across New England, New York, and New Jersey. George Schoellkopf, owner of Hollister House Garden, comments, "We're excited about the strong lineup of trail-blazing speakers for the symposium on Saturday, and we look forward to exchanging new ideas--and new plants--with gardeners from the whole region on both days." Dan Hinkley, plant explorer, founder of Heronswood Nursery, and winner of the Royal Horticultural Society's Veitch's Medal, presenting "Shade, Shadows, Sun: Life and Living in Two Gardens"
Margie Ruddick, Cooper-Hewitt National Design award-winning landscape architect, sharing her pioneering approach to landscape design in a talk entitled "Wild by Design"
Ed Bowen, proprietor of Opus Nursery and working gardener, introducing new plants that will serve as the garden archetypes of the 21st century. The day will continue with a Plant Show-and-Tell with noted plant connoisseur Marco Polo Stufano, garden writer Page Dickey, and nurseryman Adam Wheeler showing favorite plants and discussing the special merits of each. Hickory Stick Bookshop will be at the Saturday symposium selling garden-related gifts and books. After the symposium, participants are invited to a cocktail reception at Hollister House Garden in Washington, CT, with early access to the Rare and Unusual Plant Sale that will be open to the public the following morning. A silent auction of a few choice plants will also take place that evening. Admission to the reception and early buying is included in admission to the symposium. Admission to the cocktail party and plant sale preview only is also available to those not participating in the symposium. Registration for the symposium and cocktail party, including early buying at the sale of Rare and Unusual Plants, is $175 apiece for registrations purchased by August 1 and for members of Hollister House Garden and the Garden Conservancy. After August 1, registrations for non-members are $190 apiece. A special rate at the Heritage Hotel in Southbury is available for symposium participants by contacting the hotel directly at 800.932.3466 and mentioning Garden Study Weekend. Tickets for cocktails and early buying for Rare and Unusual Plant Sale (held at Hollister House Garden, Washington, CT) are $40 for Hollister House Garden members, $45 for all others. Sunday brings on the public portion of the plant sale at Hollister House Garden and the opening of five exceptional gardens (Hollister House Garden, Greyledge Farm, Maywood, Lagniappe Garden, and the Pearsall garden) in Washington, Bridgewater, and Roxbury as part of the Garden Conservancy's Open Days program. For more information on the Open Days program schedule, maps, and descriptions of each garden, visit the Open Days schedule on www.gardenconservancy.org. No pre-registration is necessary for Sunday programs. Open Days admission is $5 per person, per garden. Children 12 and under free.